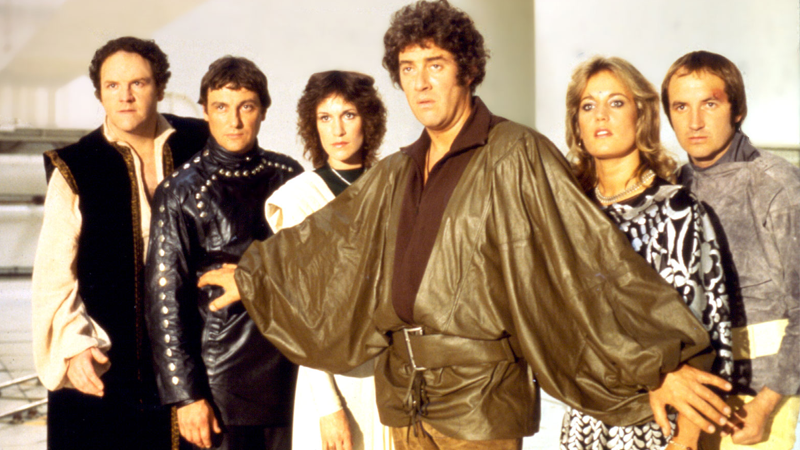 Gareth Thomas, the star of the fantastic British dystopian space opera Blake’s 7, has passed away at the age of 71. Thomas had a long and storied career on British television, but he’ll be forever known and loved for his starring role as Roj Blake. Before landing the title role in Terry Nation’s subversive scifi saga, Welsh-born Thomas began his televisual career in 1965, before landing steady work appearing on shows like Z-Cars, How Green Was My Valley, and Children of the Stones throughout the seventies, but it would be Blake’s 7 that put Thomas on the map for many people. Thomas only appeared regularly in the first two of the show’s four seasons—he decided to leave, because he was offered a slot in the Royal Shakespeare Company. But he reprised the role briefly in the third season finale, and the returned for its spectacular bloodbath of a series finale. His performance was spectacular: Blake was a science fiction anti-hero unlike anything seen on television before, as he evolved—along with the series itself—into a fascinating, morally grey hero willing to sacrifice anything (and anyone) in his fight against the sinister Federation. After Blake’s 7 ended, Thomas went on to appear in regular roles in Heartbeat and London’s Burning, and occasionally dabbled in science fiction again—playing a guest role in the 2006 Torchwood episode “Ghost Machine”, and even returning to his most iconic role in Big Finish’s Blake’s 7: The Liberator Wars audio dramas in 2012. He’s survived by his wife, Linda.